Mice are very social animals and females do best in groups of at least two. Wether or not to keep male mice together raises controversy. Some say they should only be kept alone because they will fight, while some say they do fine together as long as they grew up together. In my experience, the only way male mice can be kept together is if they come from the same litter, but I have had exceptions and therefore require males to be adopted out alone. The size of a mouse varies slightly, but most pet mice are around 3-4 inches long (not including their tail). Their lifespan is about 2-3 years. Even though mice are small, they enjoy having as much room as possible. 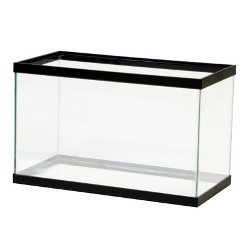 A ten gallon tank (with a secure wire lid) makes a good home for no more then three or four mice. There should be two to three inches of mouse safe bedding in the tank, such as shredded aspen or a paper based bedding such as Carefresh. Never use pine or cedar wood shavings for bedding because they have been linked to health problems in small animals. Wire cages advertised for hamsters will hold mice, but they have multiple downsides. 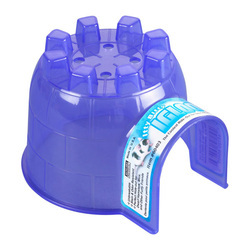 They are very hard to clean, the plastic retains the odor, they can be expensive, and they aren't chew proof. Bedding should be replaced at least once a week and the cage should be cleaned with mild soap and water at this time. Also clean/dispose of any soiled toys if necessary. Don't forget the toys! Mice have continuously growing teeth and need to be provided with safe toys to chew on. Bath tissue rolls and paper towel rolls make great toys and are safe for them to chew. Plastic igloos make a great place for them to curl up and sleep. They also make them feel safe when they are inside them. Empty cardboard boxes also make good hide-outs. Rope toys should be avoided since they can cause harm if a thread is swallowed. Mice also love wheels. But make sure to buy one that has a solid floor and has no rungs. Mice's tails and feet can get caught in the metal rung wheels and they can be seriously injured. Mice should be fed a pelleted mouse food along with a small amount of fresh fruits and veggies as daily treats. Apples, bananas, peas, carrots, and broccoli are some mouse safe snacks. Avoid feeding junk food, cabbage, chocolate, corn, candy, peanuts, and uncooked beans and onions. For the mouse's main diet a store bought bag of mouse food will suffice, although many tend to be high in unnecessary sugar and artificial ingredients. Food in the form of pellets tend to be healthier because they leave out things like artificial colors. The commercial food's formula should contain at least 16 percent protein and 18 percent fiber, and no more then 4 percent fat. Use a water bottle instead of a water dish and make sure that fresh water is always available.